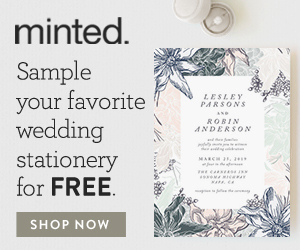 So far on our saunter through Spring we have now looked at the most gorgeous Spring wedding invitations, stunning wedding tablescapes, beautiful Spring bridal bouquets, delicious ideas for Spring wedding cakes, 5 gorgeous looks for your grooms and the most perfect palettes for a Spring wedding – phew! With just a couple more weeks to go, in today’s Snippets, Whispers & Ribbons I am sharing some wedding dresses that would be simply perfect for the prettiest of seasons….. When I think of Spring, I think of lush new greenery, delicate blossom, sweet scented flowers, blue skies and the warm sun; and for a celebration in undoubtedly the prettiest season of the year, you will want a wedding dress that matches the beauty of all of these things and more! And that’s just what I have found for you, 5 of the most perfect wedding dresses for a Spring wedding…..
With their gorgeous floral designs and splashes of colour there is something about Claire Pettibone‘s designs that always make me think of Spring. And for a garden wedding with a hint of Edwardian elegance, Gardenia from her new Romantique collection, with its dramatic floral lace, portrait back and re-embroidered appliques, couldn’t be any more perfect…..
Floral or otherwise, the delicacy of lace is perfect for a blossom strewn Spring wedding. Timelessly elegant it always hints at the romance of eras past, but with a fishtail skirt and illusion neckline it can look sophisticated as well as utterly swoonworthy for the modern bride…..
Of course Spring can still be chilly, so whatever fabric or style of dress you choose, you might be grateful for some demure and divine long sleeves, especially if you’re planning an outdoor celebration! Featuring pretty off-shoulder sleeves (that are so on-trend for 2015!) and with a delightful tea length skirt, this lace wedding dress is vintage chic at its most fun and flirty! Best of all, it is super budget friendly at under $200!…..
Or if lace isn’t for you, how about a floral wedding dress? Feminine, romantic and dainty in pastel pink, it is equally bold, modern and sure to be unforgettable for your groom and guests alike!…..
Oh and if you love this look as much as I do, be sure to take a look at the 20 floral wedding dresses I shared earlier this month – they are guaranteed to take your breath away!